Normally fragile and brittle silicon chips have been made to bend and fold, paving the way for a new generation of flexible electronic devices. The stretchy circuits could be used to build advanced brain implants, health monitors or smart clothing. The complex devices consist of concertina-like folds of ultra-thin silicon bonded to sheets of rubber. 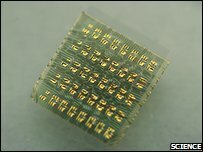 Writing in the journal Science, the US researchers say the chip's performance is similar to conventional electronics. "Silicon microelectronics has been a spectacularly successful technology that has touched virtually every part of our lives," said Professor John Rogers of the University of Illinois at Urbana-Champaign, one of the authors of the paper. But, he said, the rigid and fragile nature of silicon made it very unattractive for many applications, such as biomedical implants. "In many cases you'd like to integrate electronics conformably in a variety of ways in the human body - but the human body does not have the shape of a silicon wafer." Professor Zhenqiang Ma of the University of Wisconsin-Madison, who also works on flexible silicon circuitry, said the new research was an "important step". 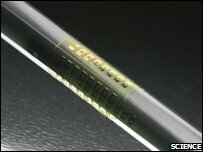 "Completely integrated, extremely bendable circuits have been talked about for many years but have not been demonstrated before," he told BBC News. "This is the first one." The chips build on previous work by Professor's Roger's lab. In 2005, the team demonstrated a stretchable form of single-crystal silicon. "That demonstration involved very thin narrow strips of silicon bonded to rubber," explained Professor Rogers. At a microscopic level these strips had a wavy structure that behaved like "accordion bellows", allowing stretching in one direction. "The silicon is still rigid and brittle as an intrinsic material but in this accordion bellows geometry, bonded to rubber, the overall structure is stretchable," he told BBC News. Using the material, the researchers were able to show off individual, flexible circuit components such as transistors. The new work features complete silicon chips, known as integrated circuits (ICs), which can be stretched in two directions and in a more complex fashion. "In order to do this, we had to figure out how to make the entire circuit in an ultra-thin format," explained Professor Rogers. The team has developed a method that can produce complete circuits just one and a half microns (millionths of a metre) thick, hundreds of times thinner than conventional silicon circuits found in PCs. "What that thinness provides is a degree of bendability that substantially exceeds anything we or anyone else has done at circuit level in the past," he said. The slim line circuits, like conventional chips, are made of sandwiches of multiple materials to form the wires and different components. The depth and relative position of the different layers, including chromium, gold and silicon, is crucial. "You have to design the thicknesses of those materials in such a way that you put what is called the neutral mechanical plane so that it overlaps with the most brittle material," explained Professor Rogers. The neutral mechanical plane is the layer in a material where there is zero strain. In a homogenous substance, this plane occurs exactly half way between the top and bottom surface, where there is equal compression and tension as it bends. This is where the silicon - the most brittle material - is usually positioned, according to Dr Rogers. "If you locate your circuits there, you can bend your overall system to a very tight radius of curvature, but your circuit doesn't experience any strain," he said. To create the foldable chips, these circuit layers are deposited on a polymer substrate which is bonded in turn to a temporary silicon base. Following the deposition of the circuits, the silicon base is discarded to reveal delicate slivers of circuitry held in plastic. These are then bonded to a piece of pre-strained rubber. When the strain is removed, the rubber snaps back into shape, causing the circuits on the surface to wrinkle accordingly. "This leads to the wavy geometry that allows the overall circuit system to be stretched in any direction you want," said Dr Rogers. The complete circuits are still relatively crude compared to top-end computer chips but have typical "silicon wafer performance" for the size of the component, he said. Other companies and researchers are working on different approaches to flexible electronics. One approach is to make so-called "organic" electronics, also known as plastic electronics. These rugged devices are made from organic polymers and have been built into flexible "electronic paper" displays. However, they are relatively slow and therefore of limited use in high performance devices. The new work offers an alternative. "There are many applications," said Professor Ma. His own work has explored the possibility of using the technology in aircraft, for example building compact antennae or creating 360-degree surveillance applications by embedding chips across the surface of the fuselage. "In some applications, such a form of stretchable and foldable integrated circuits may be the only choice," he said. Professor Rogers, working with other scientists, is concentrating on medical applications. One collaboration seeks to develop a smart latex glove for surgeons which would measure vital signs, such as blood oxygen levels, during an operation. Another aims to develop a sheet of electronics which could lie on the surface of the brain to monitor brain activity in epileptics. "Most of our energy is now focused on applications," said Professor Rogers.